George Robert Frerking, 89, died July 19, 2018 at Carnegie Village in Belton, MO. George was born in Concordia, MO. Having lost his father George G. Frerking to an accident when George was only 5 years old, George grew up on the farm with his mother Elsie and his older brother Will. He graduated from Concordia High School in 1947 and then joined the Navy. 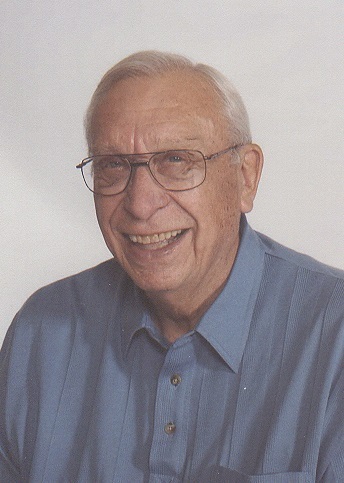 After 2 years in the Service, George worked at Bendix / Allied-Signal for 40 years as a Process Engineer, and settled in Grandview, MO where he was happily married to his wife of 50 years, Iola Mae (Kapplemann), until Iola’s death in 2004. George and Iola shared a strong faith in God and were charter members of Holy Trinity Lutheran Church in Grandview. Anyone that had the pleasure of meeting George will never forget his warm and comfortable nature, quick wit, and incredible ever-present ear to ear smile. He had a great outlook on life, loved talking to people, attracted new friends like a magnet, and truly enjoyed the travels and time that he spent with family and friends. He will be greatly missed by all. George is survived by his children and their spouses, Bruce and Barb Frerking, Ronda and Joe Chiarelli; his grandchildren, Kelsey and Blake Hasselbring, Kendyl Frerking, Nathan and Jacob Chiarelli; his great-grandson, Hugh Robert Hasselbring; and many nieces and nephews. Visitation will be Sunday, July 22 from 5 to 7 p.m. at Holy Trinity Lutheran Church, 5901 E. 135th St., Grandview, MO 64030. Funeral service will also be at Holy Trinity on Monday, July 23 at 10 a.m. and Burial in Memorial Park Cemetery. Memorial contributions may be made to the Holy Trinity Lutheran Church Memorial Fund. George’s family is forever grateful to all of the staff at Carnegie Village and Crossroads Hospice in caring for our father, grandfather and great-grandfather in his most difficult of times.